This beautiful farm land is NOT a hazardous waste dump, because the country people banded together and refused to let the state come in and trash Rowan and Iredell counties. My mom, my son and I went to a barbecue out in the country today. This wasn't the usual farmers' barbecue gathering. It was a party to honor the men and women who fought the state and won. If the community had not joined together, there would be a hazardous waste dump right where we had the picnic today. You can see a photo I shot right as we were leaving the barbecue above. 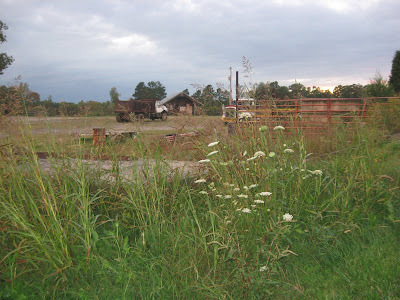 Can you imagine a hazardous waste dump there instead of flowers and farm land? Well, the people around here counldn't either. You can read a little more about the time the farmers took on the state in my earlier blog journal. I hope others will join in with information. This all took place 18 years ago, so I don't know a lot of details - mainly that we were going to have a hazardous waste dump and that we don't because the farmers decided "NO." They fought back. They won. It would a shame for that history to get lost.